Being big fans of Lego in this family when a friend told me there was a Lego snow-globe in Covent Garden before Christmas I was eager to see it. I then forgot all about it until I happened to be in Covent Garden on the occaision of our office Christmas party. There in front of me was the snow-globe! An amazing production of Londonwith some of the most famous landmarks; even the cable-car (fondly known as the Dangleway). Better behaved than another London snow-globe last year. 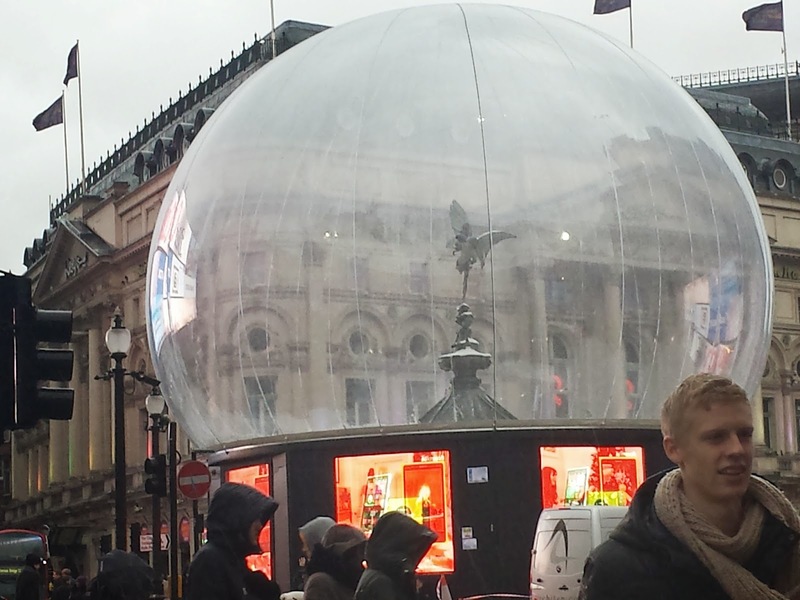 The statue of Eros (well it is really Anteros, but anyway) at Piccadilly Circus was a victim of the rather ugly weather at the end of last year. Later on the day the photo below was taken it blew loose from the moorings at hit the arrow of the statue deflating and letting the 'snow' out over Piccadily Circus, causing (predictably) rush hour traffic chaos. The ultimate irony was that the 'decoration' was actually conceived as protection for the statue from revellers over the Christmas period but ended up 'decorating' the passers by!